Heroes and monsters in classic and contemporary children's books can be a potent resource for emotional growth in children. A reading list of stories about heroes and monsters is featured on this page. Also included are fairy tales, fantasy, sci-fi, and historic fiction appropriate for children ages six through twelve. 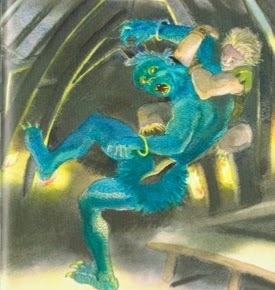 On left, above: Beowulf slays the ogre, Grendel, from a retelling by Morpurgo, M. (2006) Beowulf. Candlewick Press. 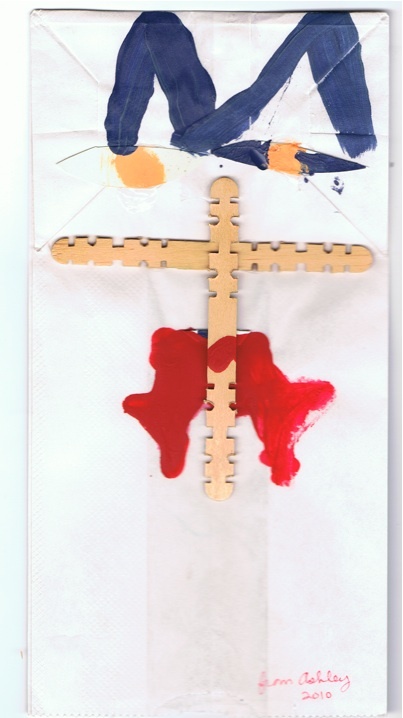 Right: A bloody monster, made from a paper bag, popsicle sticks, and tempera paint by Ashley, age 6. Colum, P. (1921/1990). The Golden Fleece and Heroes Who Lived Before Achilles. New York:McMillan Publishing/Scholastic. Pullman, P. The Subtle Knife. " "
Pullman, P. The Amber Spyglass "
Pullman, P. (2004). The Scarecrow and His Servant. Aiken, J. (1966) Nightbirds on Nantucket. New York: Doubleday & Company, Inc.
Shephard, A. (2008) The Monkey King: A Superhero Tale from China Skyhook Press. Part of series; ages 6-12. Sellier, Louis & Fei, (2008). What the Rat Told Me: A Legend of the Chinese Zodiac (easy reader, also gorgeous introduction to this topic for ages 6-12.) Note: Lunar New Year begins on February 2, 2011. It is the Year of the Hare. Jacques, B. (1993). Redwall Series, including Redwall, Mossflower, and Martin the Warrior. New York: Ace Books. Lewis, C.S. (1950). The Lion, the Witch and the Wardrobe, and The Narnia Series. England: Penguin Books. Phelps, E.J.(ed.) (1978). Tatterhood and Other Tales. New York: The Feminist Press. Ozaki, Y. T. (1903/1967). The Japanese Fairy Book. New York: Dover Publications. Yep, L. (1975). Dragonwings: Their Dream Was To Fly. New York: HarperCollins. Rowling, J.K. (1997) Harry Potter and the Philosopher's Stone. Great Britain: Bloomsbury Publishing, and the rest of the Harry Potter series. Yen Mah, A. (2005) Chinese Cinderella and the Secret Dragon Society. New York: HarperCollins. (For ages 12+, this 229 page novel is a fantasy autobiography, set in Shanghai, 1942. Bilingual, with two pages of Chinese characters and expressions translated; historic notes including text of last letters home before execution, sent by US airmen from Japanese prison camp). Carrison, M.P. (1983) Cambodian Folk Stories from the Gatiloke. Vermont: Charles E. Tuttle Company. Includes appendix with information about the people, their history, and culture, as well as a glossary and recommended reading list. Marsden, C. (2008) The Quail Club, The Gold-Threaded Dress, and more books for ages 8-12 highligihting Thai American culture. Massachussets: Candlewick Press.